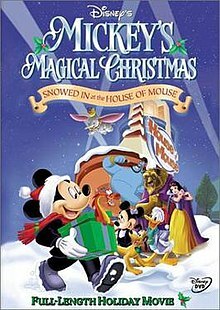 Mickey's Magical Christmas: Snowed in at the House of Mouse is a 2001 American direct-to-video animated film produced by Walt Disney Television Animation, with the animation production being done at Toon City Animation in Manila, Philippines. It is the first of two direct-to-video films spin off from the Disney Channel animated television series Disney's House of Mouse. The events of the film take place during the second season of Disney's House of Mouse. After a successful Christmas Eve show, Mickey wishes the guests a safe trip home. However, Goofy points out that they and the guests cannot leave the House of Mouse as a snowstorm has blocked up all the exits. The guests are worried, but Mickey decides to hold a free-of-charge Christmas party for them until the storm lets up. Unfortunately, Donald isn't feeling the Christmas spirit. So Mickey and Minnie play different Christmas cartoons to get him in the spirit. The cartoons they show include Donald trying to ice-skate and constantly destroying snowmen Huey, Dewey and Louie are building in a competition, Pluto trying to get Chip and Dale out of Mickey's x-mas tree, the Mickey version of the Nutcracker, along with Ludwig Von Drake's "The Science of Santa", Mickey decorating his house in blinding lights that can be seen outside of town, and interviews about what everyone wants for Christmas or feels grateful for. After all this, everyone, including villains like Jafar, are happy that everyone is enjoying Christmas. However, the crowd's mood quickly sours when Donald yells "hum bug!" to when Mickey asks if he's feeling the Christmas spirit. Mickey heads to the roof, where he tells Jiminy Cricket that all he wanted was for his friend to enjoy Christmas; Jiminy advises him to wish upon a star. Mickey does so and the star falls into his hands. Mickey returns to Donald, who he offers the honor of putting the star on the tree. Donald does so, instantly becoming jolly. The star magically begins redecorating the club, turning the reefs golden and giving the Magic Mirror a Santa hat, while turning Jafar's staff into a candy cane. Various languages saying Merry Christmas appear on the television as Mickey announces one last cartoon before a carol. After Mickey's Christmas Carol, everyone gathers on the stage, singing "The Best Christmas of All"; the camera catches Hades, Hook and Jafar not singing, prompting them to do so once they notice. Mickey wishes everyone a Merry Christmas as Tinker Bell ends the film. In addition, certain pieces of animation in the House segments are recycled the series episodes "Clarabelle's Christmas List", "Pete's Christmas Caper", "House of Turkey" and "Mickey vs. Shelby". Also, clips from the Mickey Mouse Works short "Mickey's Christmas Chaos" are played at one point.